Kivy – Open source Python library for rapid development of applications that make use of innovative user interfaces, such as multi-touch apps. You already know kivy. I think it’s awesome. I will show you how to install it in ubuntu 10.04 (lucid) from terminal and/or from Ubuntu User Interface. 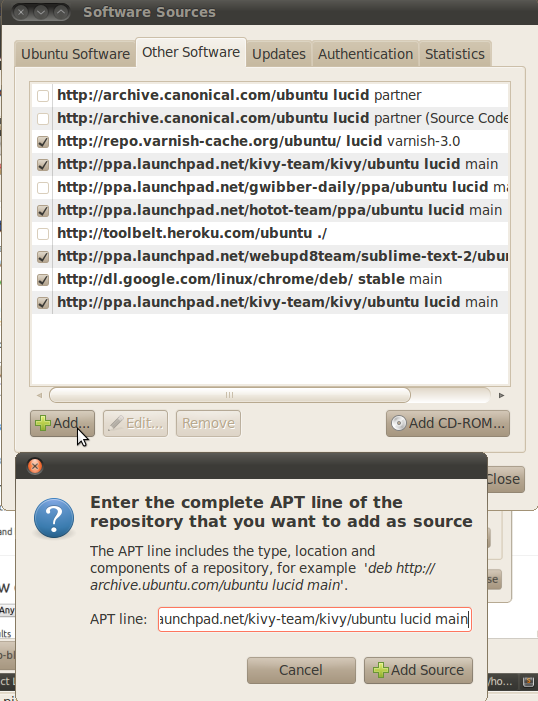 sudo add-apt-repository ppa:kivy-team/kivy OR from software sources (System -> Administration -> Software Sources -> tabs other software -> add) and insert this line deb http://ppa.launchpad.net/kivy-team/kivy/ubuntu lucid main if You do this part, just skip to step 3.